Vietnam has become a major South-East Asian hub for processing illegally logged timber, according to a report from two environmental charities. The trade threatens some of the last intact forests in the region, say the UK-based Environmental Investigation Agency (EIA) and Indonesia's Telapak. Because Vietnam has increased measures to protect its own forest, producers are getting timber from other nations. The authors add that some of the timber is reaching the UK as garden furniture. "Over the last decade, governments around the world have made a raft of pronouncements regarding the seriousness of illegal logging and their determination to tackle it," the authors of the Borderlines report say. "Yet the stark reality is 'business as usual' for the organised syndicates looting the remaining precious tropical forests for a quick profit." The report says that an increase in the price of raw timber has prompted some wood producing countries, such as Indonesia, to take steps to combat illegal logging. But, they explain, as tougher measures were enforced by one country, the problem shifts to another. EIA and Telapak say they have gathered evidence that "Vietnam is now exploiting the forests of neighbouring Laos to obtain valuable hardwoods for its outdoor furniture industry", which contravenes Laotian laws banning the export of logs and sawn timber. They add that they also obtained evidence that timber traders from Thailand and Singapore were also securing raw materials from Laos. The researchers who compiled the report said they met a Thai businessman who openly admitted paying bribes to secure a consignment of timber with a potential value of half a billion dollars. "The cost of such unfettered greed is borne by rural communities in Laos who are dependent on the forests for their traditional livelihoods," said EIA's head of forest campaigns, Julian Newman. "They gain virtually nothing from this trade; instead, the money goes to corrupt officials in Laos and businesses in Vietnam and Thailand." The authors estimate there are about 1,500 wood processing enterprises in Vietnam with a total processing capacity of more than 2.5m cubic metres of logs a year. They believe outdoor furniture accounts for about 90% of the country's total wood exports. Although the Vietnamese government has been tightening controls on logging since the early 1990s, it is also encouraging the wooden furniture industry to expand. EIA said the nation had relaxed regulations concerning ownership in order to facilitate foreign investment, and it was also actively promoting the sector in overseas markets. 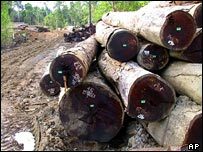 The groups said that ultimate responsibility had to rest with western markets that imported products made from the uncertified timber. "To some extent, the dynamic growth of Vietnam's furniture industry is driven by the demand of end markets such as the European Union and US," the report concludes. "Until these states clean up their act and shut their markets to wood products made from illegal timber, the loss of precious tropical forests will continue unabated." The team found that many leading brands and retailers had "taken the necessary steps" to ensure that certified and legal timber was used in products they sourced from Vietnamese producers. But researchers, posing as furniture buyers, found that a number of companies operating in the UK had failed to take the appropriate measures to ensure illegal timber was not entering the country. 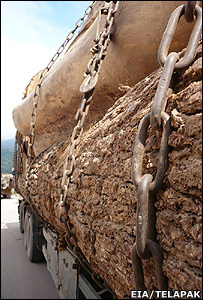 In an effort to prevent illegal timber entering its borders, the EU developed an initiative called Forest Law Enforcement, Governance and Trade (Flegt) in 2003, aimed at forming partnerships with timber producing countries. The scheme is underpinned by Voluntary Partnership Agreements (VPAs), which involve establishing a certification system to ensure only legally sourced timber enters EU markets. 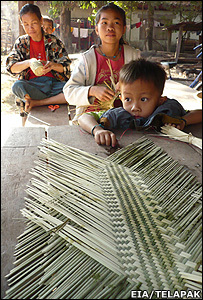 Malaysia began negotiations in 2006 to establish a VPA, and Indonesia embarked on a similar process in 2007. EIA says the system focuses on direct shipments from the country, and does not take into account the fact that raw timber can pass through several countries, eg from Laos into Vietnam. "Another problem with VPAs is that end products such as furniture are currently not included on the list of timber categories to be controlled," the report says. 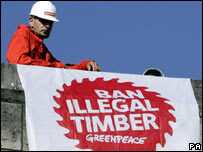 Gareth Thomas, the UK's International Trade and Development Minister, said the report raised a number of concerns. "Through the EU, we will be raising this with the Vietnamese government. I personally will be raising this with my Vietnamese counterpart," he told BBC News. "We will explore with G8 colleagues whether there is G8 action we can take in this area."